With the Kingdom of the Isles at peace, Prince Arutha can at last look forward to marrying the Princess Anita in the city of Krondor. But the capital in the west harbours many shadows. When Jimmy the Hand, a young thief in the Guild of Mockers, upsets an assassination attempt on Arutha, a sinister plot is uncovered. As the dead rise and assassins stalk the darkness, Arutha must rally the Kingdom forces swiftly if he is to save his beautiful princess felled by a poisoned arrow on her wedding day, and prevent a madman from destroying Midkemia. 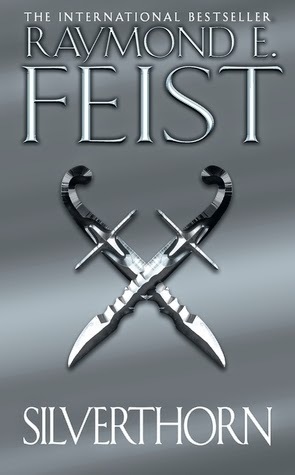 Feist’s first novel, Magician, is a sweeping epic spanning two worlds, twelve years and one devastating war. Although it’s not without faults, it exemplifies much of what makes classic fantasy so awesome. I imagine everyone who reads it expects even bigger and better things from its sequel, Silverthorn, or at the very least something just as good as Magician. As it is, the majority of the book feels like nothing more than a cheap D&D quest, i.e. an ever-expanding search for a magical McGuffin. I’m going to try and get this over with in one sentence, so here goes: in this case, the magical McGuffin is a rare plant called Silverthorn which the elves can distill into an antidote in order to save a princess who was poisoned at her own wedding during a failed assassination attempt by a secret Order collaborating with an ancient evil capable of making the dead rise and who also happens to be plotting the destruction of the world. Yeah. Melodramatic plot and overused tropes aside, the entire story arc feels like a half-arsed role-playing game in that it’s split into segments or mini-adventures which, once completed, reveal clues that lead the characters to their next location, and so on, and so on. There’s also a TON of travelling from place to place, and of rehashing events again and again whenever our characters arrive at a new place. Add to this a ridiculously caricatured depiction of evil in the form of a series of random antagonists – including several magically-created monsters which are not only unexplainable but which also never appear again – and you have the rather implausible (dare I say lazy?) and ridiculous story of Silverthorn. Gripes aside, I always enjoy returning to the world(s) Feist has created, particularly the ‘alien’ world of Kelewan (which I’d completely forgotten happened in this book). The sense of the radically different politics and honour system comes across nicely in just a few short pages and it provides a welcome change of scenery from the forests and roads of Midkemia. Additionally, Silverthorn sees many beloved characters from Magician in starring roles once again: we have Pug, Laurie, Arutha and Martin as key players, with my personal favourite Jimmy the Hand also putting in a delightful amount of page time. However, new characters are not nearly so fleshed out and as a result are pretty two-dimensional: some seem to exist simply to provide plot opportunities, such as Baru the Hadati Hillman, while others, such as Roald and Dominic, serve no real purpose whatsoever. I realise I may have given the impression that I disliked Silverthorn; and I didn’t dislike it, I really didn’t. Silverthorn is a somewhat disappointing sequel to the epic tale that was Magician: it’s silly, it’s derivative, and it’s half the book Magician was. But hey, it’s also undemanding, enjoyable and relatively harmless, and is a pleasing, if not very strong, entry in the Riftwar Cycle.